I've always been interesting in building a 3D computer model of a warship from the age of sail. I love the era and would potentially like to make an educational game or interactive book kind of about the life aboard these ships. Now, I can create 3D models pretty well and I create video games for a living but my only stumbling block is trying to read the old ship blueprints. I obviously want to accurately recreate a ship but to do so I need to understand the plans. For example, I'm currently working through the Aubrey-Maturin series of books and HMS Surprise is one of the key ships in the book. It's a smaller vessel so I thought it might be a good place to start. Does anyone have any advice or guides on how to read these? I take it each line on one perspective corresponds to a line on another perspective? How would ship builders back in the day translate these to ensure they've got the correct shape? This is obviously just the outer hull. The interior, masts, rigging and cannons would also need modelling but I'll tackle those if I can manage to get the hull done. You probably know this already, but Aubry’s Surprise is loosely based on the ship on the draught. The Unite was a French ship captured by the RN and renamed Surprise. They diverge from this point. The Surprise in the movie was built as a (sort of) replica of HMS Rose of 20 guns of the American Revolution. She was purchased for the movie, modified to match the frigate in the book (though not necessarily the frigate in the draught). When the movie was complete, she was donated to the San Diego Maritime Museum and was licensed (? Not sure of the correct term, was able to sail.) by the Coast Guard for a while, though last I heard she no longer was. Google Earth shows here still there. For descriptions of what is going on in a draught, a good source is any of several of Howard Chapelle’s books: The History of the American Sailing Navy or The History of American Sailing Ships. Probably also Yacht Designing and Planning or The Search for Speed Under Sail, though I haven’t verified that in the last two books. Brian Lavery edited a facsimile book Doctrine of Naval Architecture, 1670. It explains how a ship was designed and in doing so explains what everything means in the draught, or at least those portions that existed in the mid seventeenth century. There was another in a similar vein, though earlier, the name of which currently escapes me. Southerland perhaps? Oh, and Lavery has a book on Aubry's Surprise, also. I have no idea which CADD program you use, but I’ve found that the best way to do the hull is to trace the sections in the end view and loft them. You will probably have to use the waterlines (lines parallel to the waterline) to model the ends (bow and stern). After that, fairly standard modeling. Sorry, Carl! Really appreciate the reply and I thought I had replied but I guess my connection cut out and it didn't send or something. I'll try grab a hold of some of those books as they sound like they're quite interesting. Thank you. I do already have Lavery's book on Surprise and it has some very nice replica draughts. I managed to get a friend at work to scan them in nice and flat for me and I plan on using these to model from. I spoke to one of our vehicle artists at work and he recommended I colour code the corresponding lines on the draughts so it's a little easier to read and follow when modeling. Do you or anyone here have any idea what they represent? Are they part of the internal structure? I should really get one of those books you mentioned! I believe those are called buttock lines. If you look at the plan (overhead) view, you will see lines running parallel to the center-line (keel line) of the ship. These are the same lines on the profile (side) view. The reply screen took me away from the plan you provided or I would give you the color matches between the two views. OK, my error. Helps to see what you're trying to talk about. There are two different types of dashed lines. The upper four, the long dash lines, are deck lines. The quarter deck and forecastle are not complete, displaying the open waist. The upper deck runs full length, as does the gun deck, though it steps down at frame 10. The orlop deck similarly steps at frame 10 but only extends aft to about half way between frames 11 and 12. 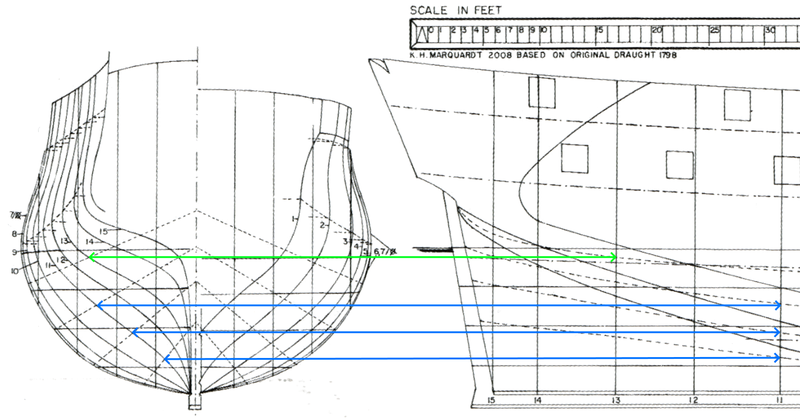 The lines with short dashes correspond to the diagonal lines on the bow/stern cross-sections. I believe they were used in fairing the lines, particularly at the ends. On some draughts the draughter will also include the port sills. Again, big help and I think I'm reading the plans correctly now. The deck lines are simple enough although I didn't know they stepped down in places, will have to investigate how that looked, very interesting! The other lines you mentioned are basically (If I understood correctly) just extra reference for the ship builders to ensure they get the correct shape? If so, that's pretty ingenious and will definitely be a massive help when modeling.